Many Christians have heard about, if not read, Pilgrim’s Progress by John Bunyan. Written in 1678 (yes, you read that right! ), while in prison for violating the English law of holding of religious services outside the authority of the established Church of England. It is considered one of the most significant works of religious English literature and has been translated into more than 200 languages. It has continuously been in print since it’s first edition and is cited as the first novel written in English. The work is a symbolic vision of the good man’s pilgrimage through life. The entire book is presented as a dream sequence narrated by an all-seeing narrator. The allegory’s protagonist, Christian, represents every man (and woman) and the plot centers on his journey from his hometown, the “City of Destruction” (“this world”), to the “Celestial City” (“that which is to come”: Heaven) atop Mount Zion. Christian is weighed down by a great burden—the knowledge of his sin—which he believed came from his reading a book (the Bible) he found while directed to clean out “Faithful’s” living quarters. This burden, which would cause him to sink into Hell, is so unbearable that he seeks deliverance. (For a deeper summary of the book, you can find one, of all places, on SparkNotes). I’ll be honest, while I’d often heard references to the Pilgrim’s Promise and although I’m an avid reader, I have never read the book. I was excited for the opportunity of an advanced screening. 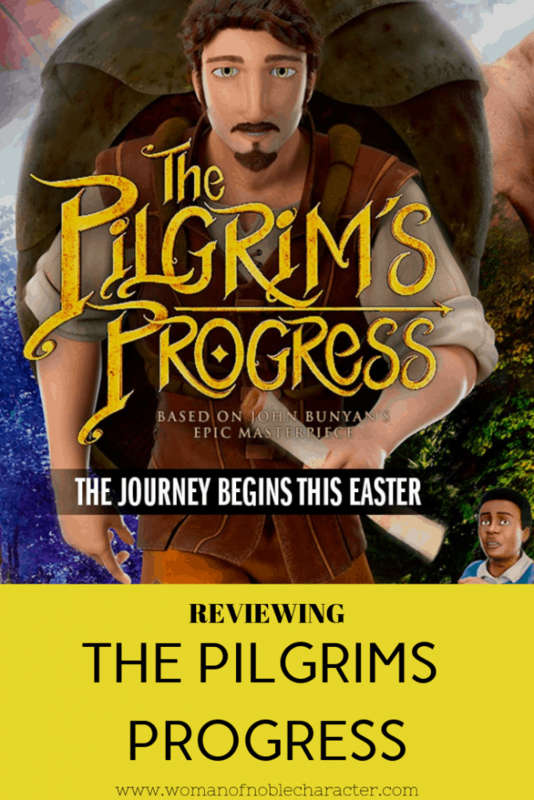 The Pilgrim’s Promise animated movie will be released Easter weekend 2019 in select theaters. Despite the long history of the book, this will be the story’s first feature-length theatrical movie. The film is being produced for worldwide distribution and will be to missionaries around the globe for free. It’s being hailed as the first major ministry film initiative in decades. Revelation Media, the creators of the Pilgrim’s Progress movie, is committed to creating projects that can serve as an asset to missionaries around the globe. Several scenes from the project were paid for through the film’s Kickstarter campaign, where more than 1600 backers gave almost $150,000 to complete the project. This fundraising method, in addition to the support of ministry partners allows Revelation Media to fund the distribution of the film to those working on the mission field. “The Revelation Media team has already targeted the first 20 languages for the film to be re-cut with voices from native speakers. This opens the door for the film to impact restricted nations where the preaching of the Gospel is prohibited and Christians often find persecution. These translations of the film will be donated to missionaries and pastors at no cost and will find a potential audience of over 3 billion people. 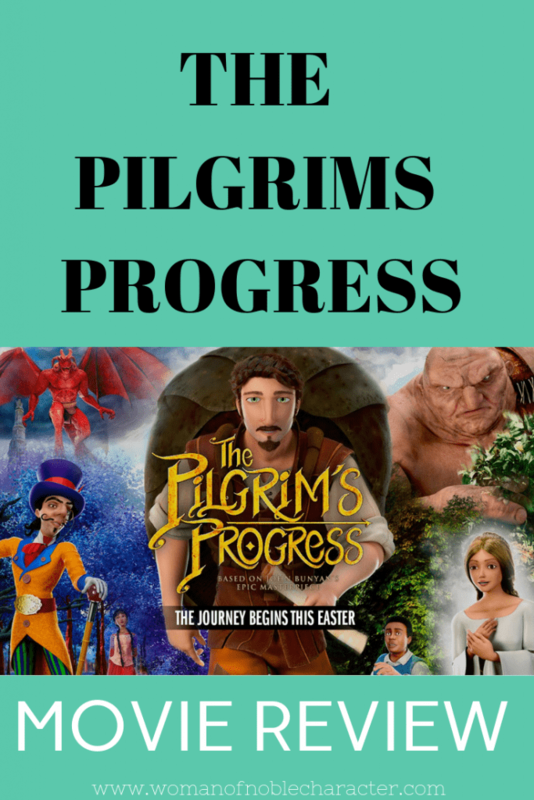 Check out the Pilgrim’s Progress movie trailer below. Created in CGI (computer graphic animation), the animation is simply amazing. The mountain and city high views look incredibly realistic and the characters nearly true-to-life. While Hollywood and Disney have budgets in the millions, most Christian films are unable to produce quality that rivals them. The Pilgrim’s Promise movie, however, does just that. My husband and I have screened other Christian movies that did not live up to the hype, so we were, I’ll admit, skeptical. From the opening scene, we were enthralled by the story, the animation and sheer brilliance of the film. To take a 250 year old story and create a relevant, engaging and instructive movie is an amazing feat, yet Revelation Media surpassed my expectations. 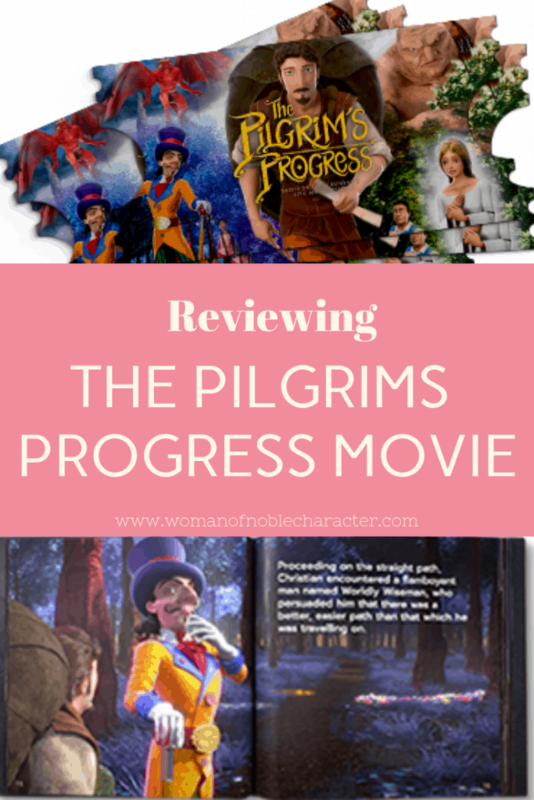 The Pilgrim’s Progress movie, while animated, is not for little ones. The story is deep and rich with meaning, which will be lost on young children. There are also scenes including monsters and destruction, which may frighten them. I’d recommend this movie for middle school and up. The movie offers a wonderful opportunity to discuss how Jesus saves and how sin can weigh us down. Use it as a springboard for sharing the gospel with friends and others. 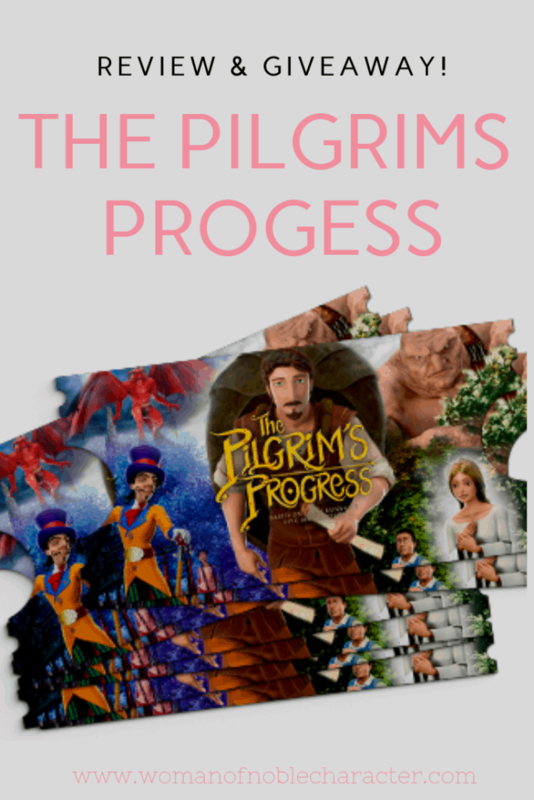 I’m thrilled to offer my readers that opportunity to win one of three Pilgrim’s Promise Illustrated Storybooks or one of three pairs of two tickets to see this movie in a local theater. 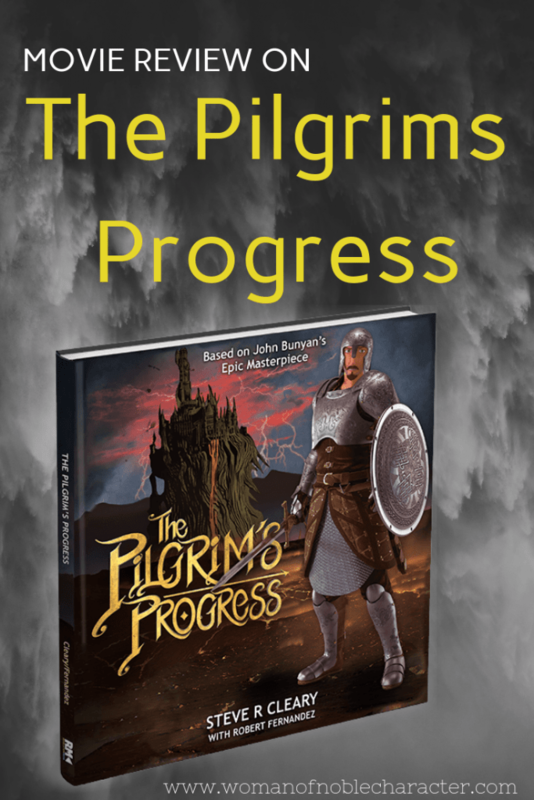 The book, a beautiful, full-color, coffee table-style, hardcover edition of The Pilgrim’s Progress illustrated storybook, valued at $24.95 is one your family will treasure. The movie tickets, offered through an e-gift card from Fandango, are redeemable to see the movie in theaters give you a great excuse for a date night or special outing with your child or friend. The tickets are valid only on 4/18/19 or 4/20/19. (The only screening dates of the movie, as of this writing). Entries are limited to US territories and Canada. There are several ways to enter, but hurry – the giveaway ends on April 13th! If you see the movie, I’d love to hear your thoughts! For more reviews of Christian movies and books, see this section of my website. I am planning to take my youngest son. He’s taking the first steps to becoming a follow of Jesus & this will be a great conversation. I’d take my daughter because this movie is appropriate for her age. My little cousin to learn about the Pilgrim’s Progress story.